Cutting across trans-generational trauma with grassroots programs for Aboriginal children 0-5 and their parents. Their Mubali program (Gomilaroi for swollen belly), uses the art of belly casting to connect disengaged young Aboriginal mothers to the Gunawirra health team and develop strong bonds with the unborn baby to improve antenatal health outcomes. The organization raised $33,650 in TFN pledge donations in 2014 to fund the program (including $10,000 from Creative Partnerships Australia) - and a steady flow of leverage has followed since. Twelve months after her candid pitch in Sydney on 26 June 2014, Gunawirra co-founder Norma Tracey still refers to TFN as the ‘lucky dip bag’ – a reservoir of network connections, resources and opportunities from which Gunawirra continues to draw. 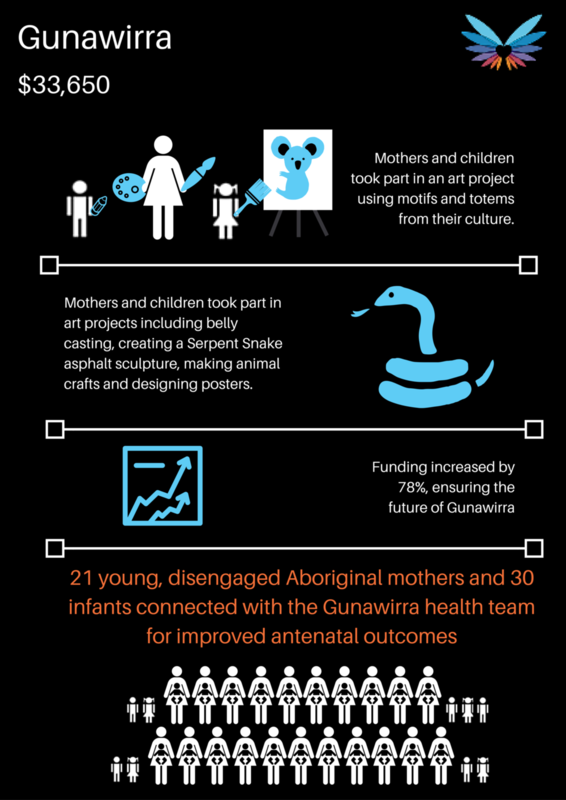 In December 2014, Gunawirra featured in TFN’s annual review, highlighting the organisation’s ability to capitalise on the financial and moral support received through TFN and, today, Gunawirra is a funding tour de force. Ninety per cent of grant applications made by the organization are successful and overall funding has increased by 78%. Meanwhile, Mubali programs funded last year have been successfully delivered and will shortly be rolled out in Kempsey and Armidale. In aboriginal mythology, Gunawirra means ‘invisible seed of all creation’. Seeking to address social problems arising from a dislocation from culture, country and history, its Mubali program seeds a psychic connection between young Aboriginal mothers and their babies from the very genesis of their shared journey - while the organisation itself continues to splice networks, skills and funding in an effort to offer even more mothers and children the cognitive sustenance to thrive.